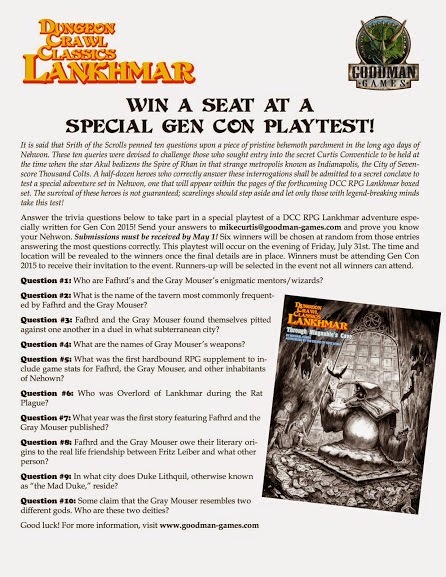 Goodman Games announced at Gary Con that they have been granted a license to produce Lankhmar themed Dungeon Crawl Classics products. The Dungeon Crawl Classics role playing game is the first role playing game since the original D&D rules that has been expressly designed to capture the tone and feel of the fiction Gary Gygax highlighted in his famous Appendix N.
Most early post-D&D role playing games fell into three camps. They were either designed to be easier to play versions of D&D that shared some of the inspirations (Tunnels & Trolls falls into this category), designed to emulate more realistic combat and character creation with a consistent world mythology that varied from D&D (Runequest and The Fantasy Trip fall into this category), or D&D micro-improvement clones (Arduin and Warlock) fall into this category. None of these games quite fit into the category of "Fantasy Heartbreaker" coined by Ron Edwards, for reasons that become clear when one reads the full Edwards piece. Many of these games, The Fantasy Trip I'm looking at you, were designed to present consistent mechanics that emulated some kind of physics. In moving this direction, these games actually moved away from Appendix N influence and became something else. D&D was a hodgepodge of influences, all narrative. Runequest too had a hodgepodge of influences, but one of them was SCA combat experience. Basing combat on real world experience is a solid design goal, but it isn't a design goal driven by an attempt to emulate the fantasy in Appendix N. It's hard to imagine someone attempting Fafhrd's escape from the Ice Witches by strapping fireworks to his skis using the Runequest or The Fantasy Trip rules. They weren't free form enough. To be fair, it's hard to imagine that happening in AD&D either. I can see it happening in Moldvay/Cook Basic, but interestingly enough that game actually falls into that first category of post-D&D design. All of this brings us back to Dungeon Crawl Classics. 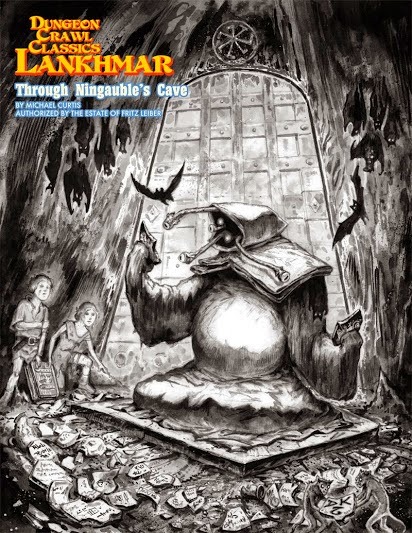 It is very easy to imagine this game inspiring such a scene, and Doug Kovac's strong focus on what Jeff Vandermeer calls "The Weird" only adds to the seeming natural connection between DCC and Lankhmar. There is only one other game that I think can capture the adventures of Fafhrd and the Gray Mouser well, and that's Savage Worlds. A game that I believe also has a license to make Lankhmar based products. The Savage Worlds game will likely, in my completely uninformed opinion, focus more on the street level heroics of Nehwon and so there will be little cannibalism between the two games. In fact, I think there might be some great synergy between publishers. 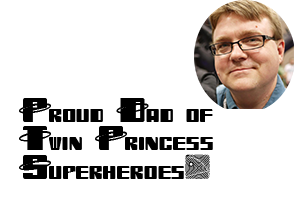 Goodman Games is running a contest which will allow people to playtest their upcoming adventure at Gen Con. 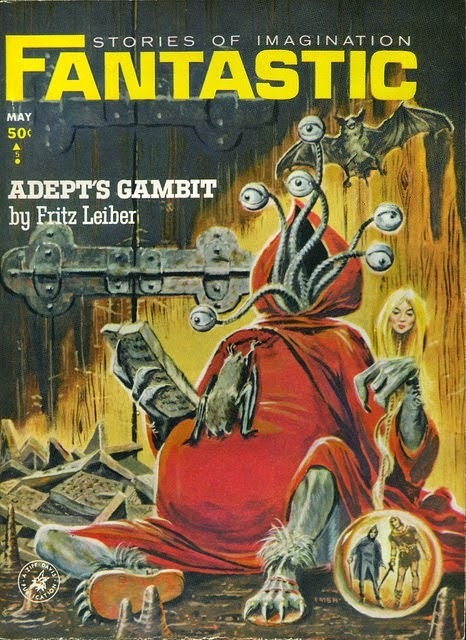 As an aside, I think that the DCC cover is a nice homage to the old Fantastic cover that featured Ningauble, Fafhrd's weird and enigmatic patron.